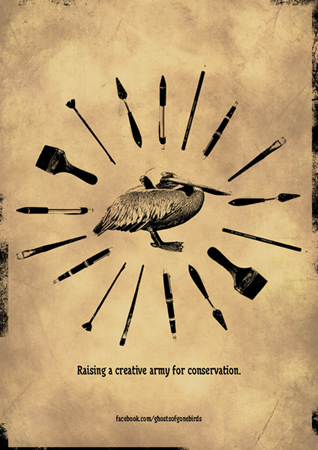 Ghosts of Gone Birds is about raising a creative army for conservation through a series of multimedia exhibitions and events that are concerned with breathing artistic life back into extinct birds species, whilst raising awareness of those species that teeter on the edge of extinction but can still be saved. Over 120 artists, writers and musicians took part in the London phase of the project, which featured a couple of events in the English capital last November. FISH HOOKS DON’T JUST HOOK FISH. THEY CATCH AND KILL 100,000 ALBATROSS. EVERY YEAR. Dying at a rate of around one every five minutes, the albatross family is fast becoming the most threatened family of birds in the world. In fact, they are disappearing at a rate faster than they can actually breed – so 18 out of the 22 species of albatross are now facing global extinction. BirdLife International set up the Albatross Task Force to work with local fishermen in countries throughout the world to introduce new practices that would reduced the life-threatening danger to seabirds. And as a result, in countries like South Africa there has been a 85% decrease in the number of seabirds caught in fishing lines. It is the combination of the creative with the campaigning that gives Ghosts of Gone Birds such a persuasive message, and it will be really interesting to see what they have planned for future exhibitions and events. You can see a complete list of the artists involved in the project so far here. This entry was posted in Birds on June 18, 2012 by Paul Scraton.